Have you ever been to Kos? That’s a beautiful island in Greece you definitely should visit next summer! I just found a great deal on Sunweb for you guys: from only 2844 kr you can spend 7 days in Kos at a great 4* hotel by the Lambi beach, enjoy the all-inclusive board and flights & transfer are included, too! You’ll spend 7 nights at the great 4* Atlantis Beach. The hotel is just a few meters away from the beach. You can relax at the outdoor pool. If you want to do something sporty, you can play some beach volleyball or table tennis. While on Kos, you will enjoy the all inclusive board which includes all meals and also snacks, ice cream, drinks and much more. On TripAdivsor, the hotel received a 4 out of 5 rating from almost 1.000 different reviews. 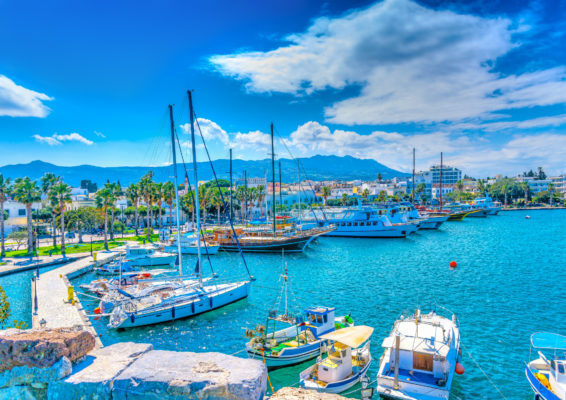 On Kos, you can sunbathe at fantastic beaches, taste the Greek cuisine and spend the night in Kos Town at the harbor. When in Greece you definitively have to try fresh fish and seafood with lemon combined with a glass of Retsina (Greek white wine) and served with some Tzaziki and Greek feta cheese from the oven. There are dates available from May – October 2019. Click through the link and see if you can find something that fits with your schedule. Your flights will be with Norwegian or SAS from Billund or Copenhagen to Kos. Checked luggage and hand luggage are included in the price. Let’s go to the Kos deal! Sign up for my Newsletter, and don’t miss anymore deals. You’ll be the first to find out about our Kos bargains!